He’s an odd one, Sufjan Stevens, at least from the wikipedia entry. I came across him about a year ago when I fell in love with a couple of his songs: Casmir Pulaski Day, The Transfiguration, The Dress Looks Nice on You. I lost these songs a few months back when I was mucking around getting my Ipod set up. I was re-intrigued when I heard him again on the soundtracks of both Little Miss Sunshine and Driving Lessons. Despite all this, I never bothered – although I wanted to. My friend Analise suddenly got obsessed but followed me in just leaving it. 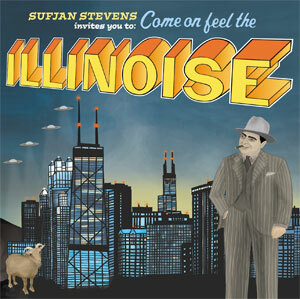 I found his CD Illinois (or Come on feel the Illinoise) on sale the other day! Now I am a very satisfied, owner, listener, appreciator. This is Indie folk at it’s best and stangest!